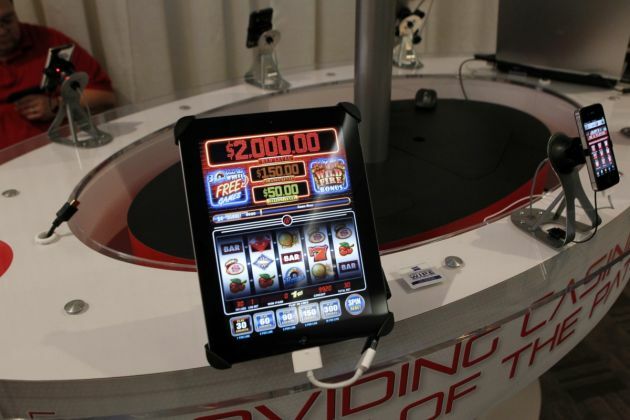 (Photo: REUTERS / Beck Diefenbach)San Manuel Indian Bingo and Casino's online gambling app "Code Red" is demonstrated in the exhibitors room at the GiGse online gaming convention at the Westin hotel in San Francisco, California, April 24, 2012. Online poker is a business that involves processing billions of dollars worth of bets and battling the fraudsters, cheats and robot-player software that can ruin the games. Hence the casinos are cozying up to some tech-savvy offshore partners whose pedigrees might give regulators pause. Online gambling is popular in Scotland. London's mayor Boris Johnson has criticized the rise of controversial Fixed Odds Betting Terminals that are known as the "crack cocaine of gambling." Speaking to the Daily Mail newspaper, the London Mayor urged Ministers to cut the maximum stake on the machines from 100 British pounds (US$150) to 2 pounds ($3), the Christian Institute reported. The London Mayor said he believes fixed odds betting terminals can be dangerously addictive and allow bookmakers at betting shops to prey on vulnerable people. His comments come during growing concern about the effect of online gambling sites, including further accounts of the damaging effects of these websites expressed by community organizations and churches. Johnson said: "Fixed odds betting machines are the scourge of our High Streets and a very bad thing for our community." He noted, "They can be dangerously addictive, their promise of whopping wins only gives false hope, and they prey on the vulnerable within our society. (Photo: www.london.gov.uk/)London's mayor Boris Johnson in 2015. "I have urged the Government to proceed with the utmost caution when considering the maximum stakes available on these machines." At the moment gamblers can lose up to 100 pounds a spin while using the terminals, which mimic casino games such as roulette. Johnson advocates the approach taken by "local authorities, charities and faith and community groups to limit the stakes." Rev. Colin Jones, pastor at Three Bridges Free Church in Crawley in the south of England, says members of the public have come to the church for help for gambling addictions. The church, in Three Bridges Road, has two betting shops close by. Jones said: "The rise of betting shops and gambling exploits the poorest and most vulnerable people in society," the Crawley News reported . "People in dire situations can feel it is a way out of their difficulties, but you cannot beat the bookmaker. "They wouldn't be in business and opening so many shops if they weren't making extortionate amounts of money."